With 13 wins in their last 15 matches, the Sounders can still claim a first-round playoff bye with a home win over San Jose next Sunday and a loss or draw by FC Dallas at Colorado. There’s good news and bad news for Sounders fans when it comes to their team securing a first-round playoff bye after Sunday when the team posted its first regular-season victory at Houston. The good news is, a victory over Major League Soccer’s worst team, the San Jose Earthquakes, at home Sunday leaves the Sounders in contention for the Western Conference’s No. 2 spot and avoiding the playoff “knockout’’ round. But the bad news is a road victory by FC Dallas over a Colorado side nearly as awful as San Jose would mean the Sounders can finish no better than third and must play a single-match elimination game. Schmetzer speaks the truth when it comes to the rarity of what his club has pulled off. The Sounders’ record for consecutive victories prior to this year was five – which they can now match twice in this one campaign if they beat San Jose. They dropped two consecutive last month after a league-record nine victories in a row in the post-shootout era, but now have won four consecutive matches since to climb to fourth in the conference. The Sounders have gone 14-2-2 over more than a half-season stretch to guarantee no worse than a tie for their third-best points finish ever. Only their 2014 Supporters Shield squad and the 2011 edition finished with higher points totals at 64 and 63, respectively, while the 2012 team also had 56 points as the current Sounders do with one match to go. At 17-11-5, a victory in their season finale would tie the Sounders with the 2011 team for the second-most victories in franchise history behind only the 20 posted by the 2014 edition. Not too shabby when the squad’s playoff chances seemed all-but-lost after a stunning home defeat against Portland on June 30. But with just two defeats since, the Sounders can do no worse than being the hosts of a “knockout” stage match with just a tie against San Jose. However, given the jam-packed conference standings, a defeat against the MLS cellar-dwellers could see the Sounders tumble into fifth place if the Portland Timbers win their finale and potentially force Schmetzer’s crew into an undesirable road contest against their arch-rivals. A big reason for the Sounders’ resurgence this season, beyond forward Raul Ruidiaz – who Sunday scored his eighth goal in 13 games since his July transfer – has been the dominant play of midfielder Nicolas Lodeiro. He picked up three assists against Houston, giving him a team season-record 15 this year and a club-record 35 in just 2½ seasons of play. Lodeiro and Ruidiaz have formed one of the league’s most dynamic scoring combinations. Along with Stefan Frei emerging as a frontrunner for MLS Goalkeeper of the Year and Chad Marshall for Defensive Player of the Year – scoring his fourth goal of the season Sunday – the team looks as balanced as any the franchise has ever put on the field. Lodeiro said he’s just as happy setting up Ruidiaz as he is scoring his own goals. He said the Sounders have treated all recent matches like playoff contests and can’t afford a letdown now against a dismal 4-20-9 San Jose side. 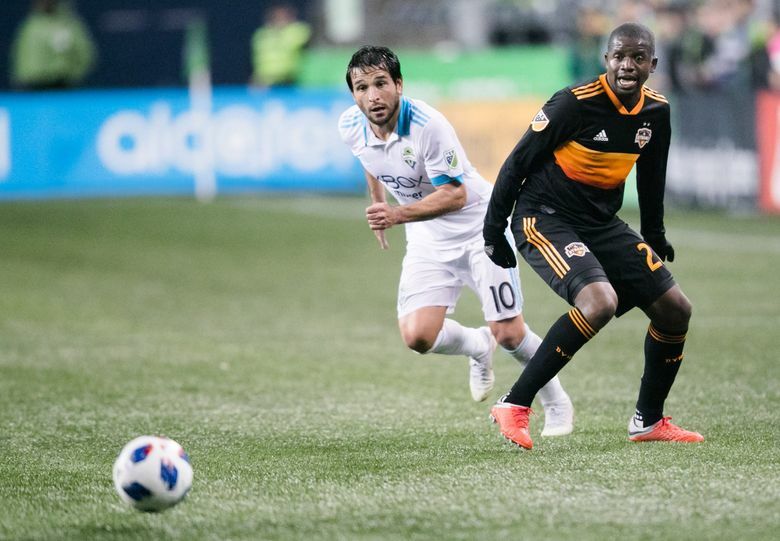 The Sounders have shown a propensity for late defensive lapses in their past three victories – letting Houston back in it Sunday after second-half leads of 2-0 and 3-1 – that could be harmful if they continue come playoff time. That’s why a first-round bye, or at least a home game in the knockout round, is important for this club. The Sounders have had precious little margin for error the past five months and there will always be concern they’ve overtaxed themselves on this remarkable run just to make the postseason. Any shot at a conference title vanished after Sunday. Conference-leading Sporting Kansas City has 59 points and plays No. 2 LAFC, currently at 57 points, in their season finale. One will either win or tie and be too far ahead for the Sounders to catch both. Dallas also has 57 points – one more than the Sounders – so if it fails to win at Colorado, the Sounders could still overtake Dallas if they beat San Jose and would also be guaranteed to catch one of KC or LAFC. Given that the Sounders would then finish with more victories than two of the three clubs currently ahead of them under such a scenario, they would hold the automatic tiebreaker and – incredibly, given their position back in June — finish second and secure the opening-round bye.